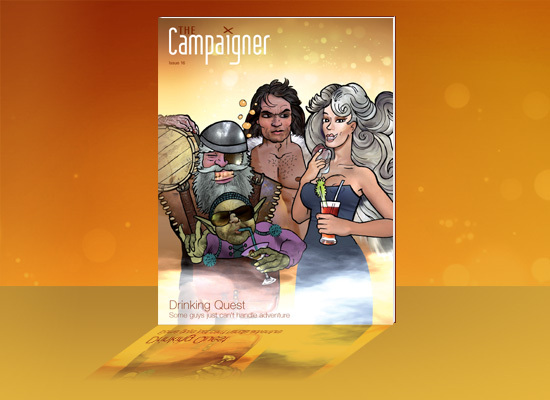 This issue features the fantasy roleplay game Drinking Quest. They talk to the games designer and publisher, Jason Anarchy, about the inception and execution of a game which merges drinking games and rpgs. Five of the popular YouTube roleplay group Dicestormers discuss the show, how recording affects their games, and where the team is headed. They look at TableTop Day once again, and explore two events which both embody the day’s ideals, while each being unique in their own right. All this plus Worlds of Roleplay, Terrain Crusade, Featured Hobbyist Kye Twosheds, and much more. The magazine is free to download, with print-on-demand copies also available.